The animals that need young forest and shrubland often find themselves living among exotic invasive shrubs (often simply referred to as invasives), including autumn olive, multiflora rose, Japanese barberry, buckthorn, and bush honeysuckle. These non-native plants may provide dense vegetative habitat, but they spread at the expense of native shrubs that may offer better food and cover. When making young-forest or shrubland habitat, avoid actions that favor invasives. All habitat management activities should be carefully evaluated for their potential effects, since practices such as timber harvesting or cutting and burning can help spread the seeds of invasive plants or create conditions that favor those undesirable aliens. 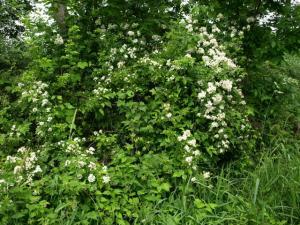 If your site already hosts non-native shrubs (many shrublands in the Northeast have them), consult with a natural resource professional to learn what your options are. Removing all invasives at once may harm local wildlife. It may make sense to gradually remove exotic plants over a period of years. Conservationists recommend ongoing monitoring and management to prevent exotic species from dominating a site – something that invasives can do quickly, sometimes in only two or three years. Different kinds of invasives can be controlled in different ways. Learn about manual, chemical, and biocontrol techniques in “Invasive Exotic Plants in Early-Successional Habitats,” Chapter 8 in Managing Grasslands, Shrublands and Young Forests for Wildlife: A Guide for the Northeast. Below find a link to a paper, "Toward Consensus-Based Actions that Balance Invasive Plant Management and Conservation of At-Risk Fauna," from the journal Environmental Management, published in August 2013.